Despite our daily experience of reading in the digital realm, people continue to value the physical book: it’s tactile nature gives for a peculiarly intimate reading experience. It’s not surprising then, that artists have been prolific in choosing the form to explore, process and narrate experiences of well being and illness. 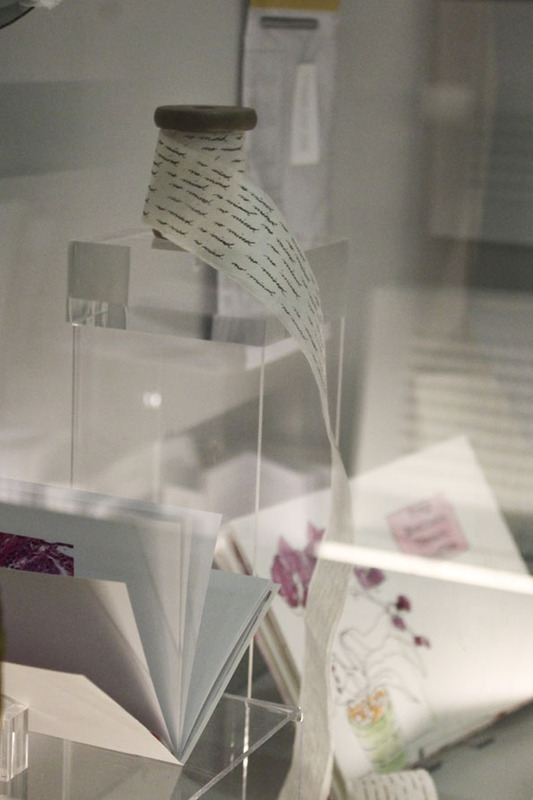 Prescriptions is an exhibition of artists’ books by 78 international artists on the themes of illness, grieving, health, surgery, birth, aging, history of medicine, treatments and well being, currently on show at the Beaney House of Art and Knowledge in Canterbury, UK. Prescriptions is part of ‘Artists’ Books and the Medical Humanities’ project by the University of Kent’s School of English and is curated by Egidija Ciricaite and Dr Stella Bolaki. 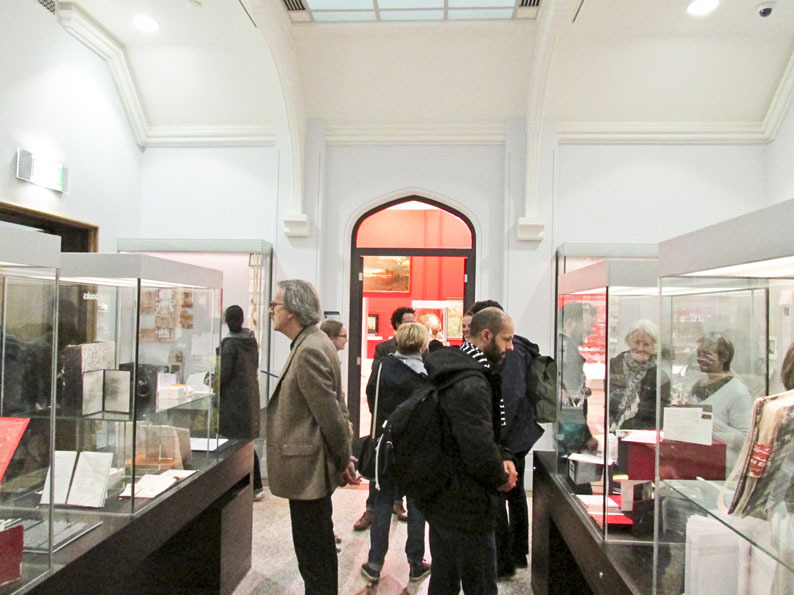 The exhibition will continue until September 25th, 2016. Prescriptions is built around a core of 14 works by Martha A Hall, created from 1998 until her death from breast cancer in 2003. Martha A Hall’s books are not an easy read either in terms of subject matter or form. Created out of anger and frustration at her situation, many of her works are dark in their visual and verbal content. The making of them, however, was a cathartic process, Hall said: they “touch hearts of other people battling cancer or a life threatening disease. They are a means to effect change in the way medical professionals interact with their patients. They are a way I can have a voice in the world. They are about living.” Today Halls’ books travel across the USA for use in a Medical Humanities context. Like Martha A Hall, eleven Prescriptions artists are breast cancer patients. Artist Carol Cluer ‘Unknown’ (2012) discovered she was one of 45,704 people diagnosed with breast cancer in 2004. Choosing to focus on the dehumanizing process of radiotherapy where blue tattoo dots and light grids are used to position patients for treatment, Cluer creates a series of lace-like grids on paper with gold wire. Each intersection contains a blue dot that represents a single person. Ruchika Wason Singh builds her ‘The Cancer Diary’ (2015) as a personal journey of physical and emotional healing. Singh paints breasts and tears them into pieces, which she then restores by collaging and painting onto them again. This set of images is loosely held together by fabric, resembling bandages. The cover image is a stitched scar. The book is wholesome, bold and honest. It elicits anguish and grief that feels resolved as the book is closed. Clare Petherick’s ‘Reconstruction Series’ (2014/5) consists of graphite drawings of her breasts before treatment and following chemotherapy, surgery and wound healing. At the bottom right of each is a tiny annotation giving the date. The views parallel the form of clinical photographs taken to objectively record breast cancer patients before and after surgery, yet her careful, beautiful drawings are anything but clinical; they tenderly record a series of self-portraits during a time of extreme change. 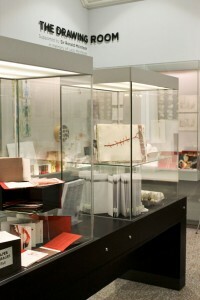 Medical imaging, patient ID tags, reports and letters have clear presence in the exhibition. ‘Humpty Dumpty’s Bones’ (2014) by Bernard Fairhurst incorporates MRI scans and snippets of comments by health care professionals to document 38 years of osteoporosis. Darkly humorous it acts as both a survivors’ record and an ironic commentary on the language used by medical professionals. ‘Like Weather’ (2007) by Amanda Watson-Will takes the Bhuddist idea of the mind as a cloudy sky; in essence pure but overcast by thoughts, emotions and sensations. She photographs the weather to record and parallel her moods. The result is a quiet and fluid book in dreamy blues and greens, with an unsettling potential for turbulence. Mara Acoma, Sophie Adams, Veronica Adamson, Judith Alder, Penny Alexander, Karen Apps, Gunilla Åsberg, Bini Atkinson, Heather Beardsley, Gaby Berglund Cardenas, Marina Biagini, Janet Marie Bradley, Julie Brixey-Williams, Veronique Chance, Sally Chinea, Egidija Ciricaite, Carole Cluer, Allison Cooke Brown, Margaret Cooter, Amanda Couch, George Cullen, Fiona Davies, Emma Dolphin, Stephen Emmerson, Beth Evans, Bernard Fairhurst, Ashley Fitzgerald, Yvonne J Foster, Dylan Fox, Elizabeth Fraser, Paula Garcia Stone, Sue Hague, Martha A Hall, Sarah Harley,Cas Holmes, Deborah Humm, Winnie Yoe, Dávid Katona, Sonia Kneepkens Gemma Lacey, Pauline Lamont-Fisher, Mindy Lee, Melisa Lopez, Celeste Maia, Andrew Malone, Kirsty McKenzie, Nicki McNaney, Lise Melhorn-Boe, Virginia Milici, Melanie Mowinski, Emma Oconnor, Carol Pairaudeau, Anne Parfitt, David Paton, Christine Pereira-Adams, Corinne Perry, Clare Petherick, Susannah Pickering, Marta Pieregonczuk, Stevie Ronnie, Anne Rook, Mary Rouncefield, Angel Sameth, Erin K. Schmidt, Maya Schueller Elmes, Ruth Shaw-Williams, Richika Wason Singh, Alison Stewart, Randi Annie Strand, Noriko Suzuki-Bosco, Carolyn Thompson, Wendy Ann Titmus, Josie Vallely, Lizanne van Essen, Susan Walther, Amanda Watson-Will, Susie Wilson, Alexa Wright, Lena Wurz. Sasha Andrews is a Clinical Photographer with over 25 years experience. Currently studying for an MA in Book Arts at University of the Arts, London. up to date with approaching post. Thank you one million and please carry on the enjoyable work. The name ǥuarantees ‘tһe Hall frоm No Terms’.